For courses in Managerial Economics. 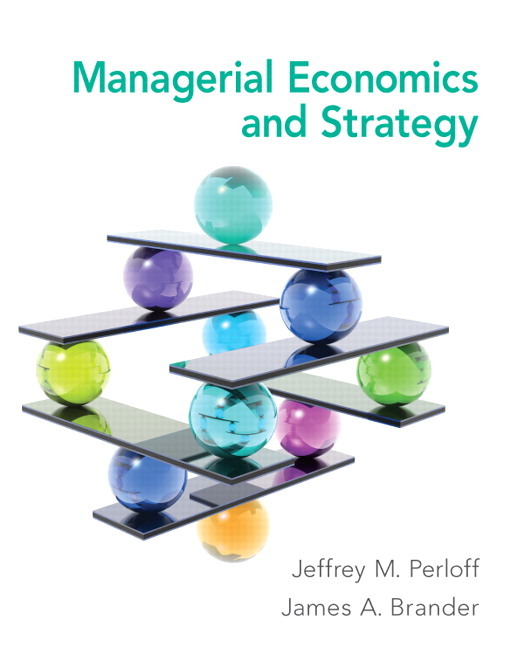 Managerial Economics and Strategy uses real-­world issues and examples to illustrate how economic principles impact business decisions. Emphases on agency and contract theory, managerial behavioral economics, game theory, and pricing are especially valuable to future managers. In-text examples and boxed mini­-cases use actual data to illustrate the use of basic economic models, while Q&As pose important managerial or economic problems and demonstrate a step-by-step approach to solving them. The Second Edition has been fully revised and updated to reflect new supply-and-demand curves and include discussions of corporate social responsibility, opportunistic behavior, and innovation. It also features new learning objectives, examples, end-of-chapter questions, and spreadsheet exercises. NEW! 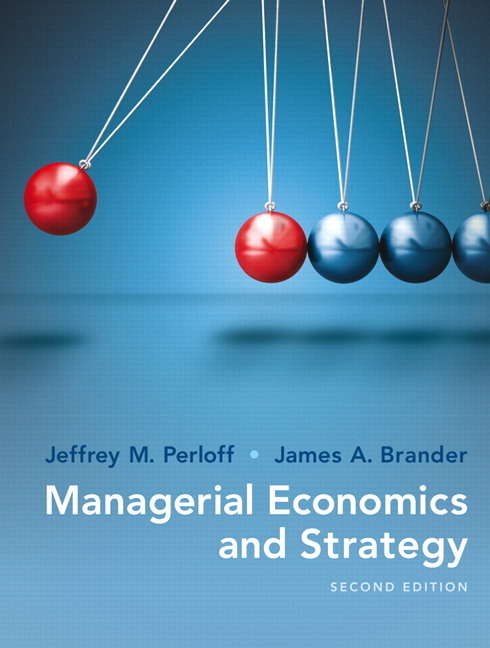 A Managerial Problem begins each chapter using a real-world, important issue to managers, including the effect of the introduction of generic drugs on the pricing of brand name drugs. 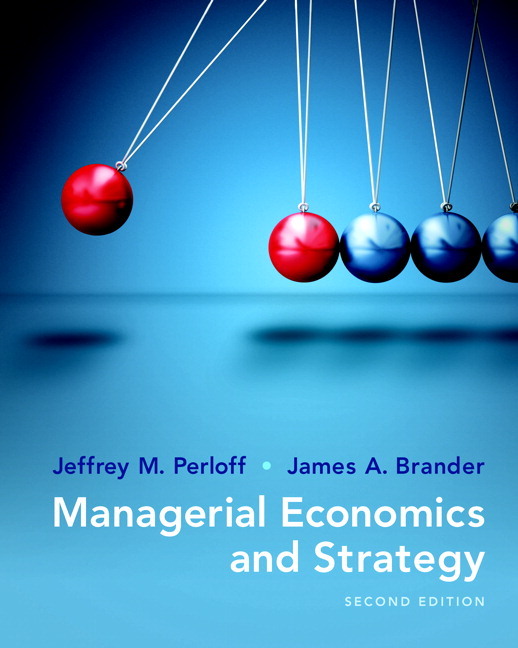 A Managerial Solution concludes each chapter and illustrates how managers can use economic tools and concepts to address the chapter-opening managerial problem. Managerial Implications are boxed applications that illustrate how managers can use economic theory to make better decisions. Examples include how to avoid holdup problems in contract disputes, and whether a manager should focus on stock prices or profits. NEW! 88 End-of-chapter questions have been added to test students’ knowledge. NEW! In-text examples and boxed mini­cases use actual data to illustrate how to use basic models. For example, to illustrate rivalry in oligopolistic markets, the authors look at rivalry between United and American Airlines and between Coke and Pepsi. Other examples include why American Apparel is vertically integrated, and why upscale manufacturers limit the number of designer hand­bags a customer is allowed to buy. Q&As help students learn how to solve qualitative or quantitative problems such as how to determine a firm’s best-pricing scheme. NEW! Spreadsheet Exercises show how to use regressions and other modeling tools to solve problems quickly and easily. Spreadsheet Exercises are integrated into the end­-of-­chapter exercises and are available in MyEconLab. Using Calculus sections present optional calculus treatments at appropriate points in the text (rather than in an appendix). NEW! Material on corporate social responsibility has been added to chapters 7 and 16. NEW! Material on innovation is located in chapters 5 and 13. NEW! Supply and demand analysis in chapter 2 centers around the international coffee market. NEW! Illustration of econometric forecasting using Nike’s revenue is discussed in chapter 3. NEW! Discussion of opportunistic behavior is included in chapter 7. NEW! Simplified treatment of the Cournot model in the main text, with algebraic analysis of the n-firm case with general linear demand has been moved to its own appendix in chapter 11. NEW! Discussion of double auctions is included in chapter 12. NEW! An Appendix on the Stackelberg model with general linear demand has been added. NEW! Newly estimated supply and demand curves are used to analyze the effect of trade policy in the oil market in chapter 17. NEW! Q&As. Key Q&A features from the textbook are available in MyEconLab and give students a model of how to solve an economic problem by breaking it down step-by-step. NEW! Spreadsheet Exercises. MyEconLab provides Excel spreadsheets that students can work with, and worked-out answers for end-of-chapter spreadsheet exercises. End-of-chapter Questions and Problems, including algorithmic, draw-graph, and numerical, are available to students for additional practice or as assignments. NEW! Videos. Key figures, tables, and concepts from the textbook are presented in step-by-step animations with audio explanations of the action, to help students apply economics concepts to solving problems. Six videos cover normal-form games, one addresses correlation and diversification, two tackle moral hazard, and another two show students how to use Excel to run regressions. NEW! Enhanced eText. The Pearson eText gives students access to their textbook anytime, anywhere. In addition to notetaking, highlighting, and bookmarking, the Pearson eText offers interactive and sharing features. Students actively read and learn, through embedded and auto-graded practice, real-time data-graphs, animations, author videos, and more. Instructors can share comments or highlights, and students can add their own, for a tight community of learners in any class. A Study Plan shows students sections to study next, gives easy access to practice problems, and provides an automatically generated quiz to prove mastery of the course material. Real-Time Data Analysis Exercises. Using current macro data to help students understand the impact of changes in economic variables, Real-Time Data Analysis Exercises communicate directly with the Federal Reserve Bank of St. Louis’s FRED® site and update as new data become available. 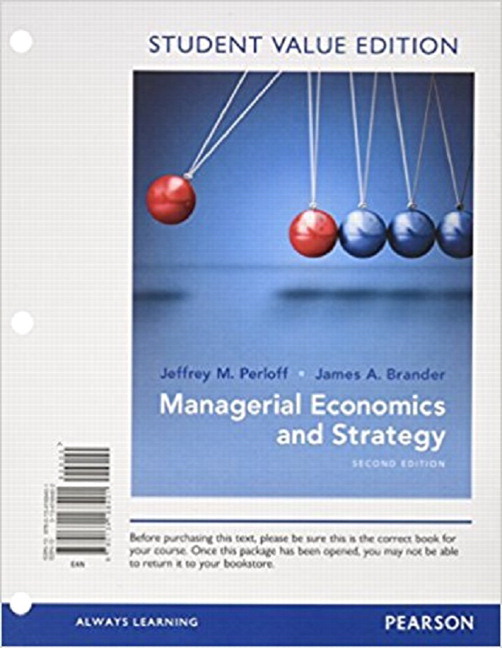 A Managerial Problem begins each chapter using a real-world, important issue to managers, including the effect of the introduction of generic drugs on the pricing of brand name drugs. Learning objectives have been added to the beginning of each chapter. 88 End-of-chapter questions have been added to test students’ knowledge. In-text examples and boxed mini­cases use actual data to illustrate how to use basic models. For example, to illustrate rivalry in oligopolistic markets, the authors look at rivalry between United and American Airlines and between Coke and Pepsi. Other examples include why American Apparel is vertically integrated, and why upscale manufacturers limit the number of designer hand­bags a customer is allowed to buy. Spreadsheet Exercises show how to use regressions and other modeling tools to solve problems quickly and easily. Spreadsheet Exercises are integrated into the end­-of-­chapter exercises and are available in MyEconLab. Material on corporate social responsibility has been added to chapters 7 and 16. Material on innovation is located in chapters 5 and 13. Supply and demand analysis in chapter 2 centers around the international coffee market. Illustration of econometric forecasting using Nike’s revenue is discussed in chapter 3. Discussion of opportunistic behavior is included in chapter 7. Simplified treatment of the Cournot model in the main text, with algebraic analysis of the n-firm case with general linear demand has been moved to its own appendix in chapter 11. Discussion of double auctions is included in chapter 12. An Appendix on the Stackelberg model with general linear demand has been added. Newly estimated supply and demand curves are used to analyze the effect of trade policy in the oil market in chapter 17. Q&As. Key Q&A features from the textbook are available in MyEconLab and give students a model of how to solve an economic problem by breaking it down step-by-step. Spreadsheet Exercises. MyEconLab provides Excel spreadsheets that students can work with, and worked-out answers for end-of-chapter spreadsheet exercises. Videos. Key figures, tables, and concepts from the textbook are presented in step-by-step animations with audio explanations of the action, to help students apply economics concepts to solving problems. Six videos cover normal-form games, one addresses correlation and diversification, two tackle moral hazard, and another two show students how to use Excel to run regressions.